Lakes of Wood - The ORIGINAL Wooden Lake Map! 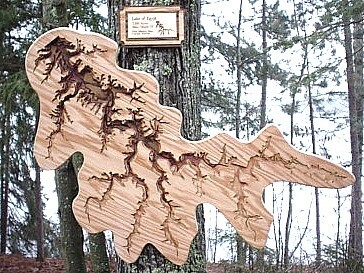 The ORIGINAL Wooden Lake Map! that reveal the hidden bottom topography of your lake of choice. 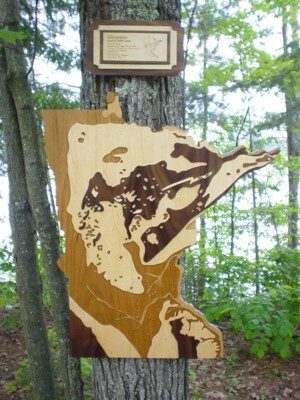 Located in Three Lakes, Wisconsin, we can create pieces of art based on many lakes in the nation using available hydro topographical maps. Please check with us to see if depth maps are available for your lake. 13,000+ lake depth maps are available for Minnesota and Wisconsin alone! 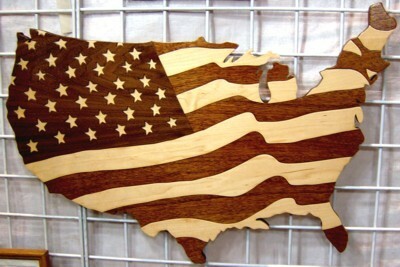 Other states, as well as Canada, also have depth maps of some of their lakes, allowing us to produce Lakes of Wood from maps all across North America! 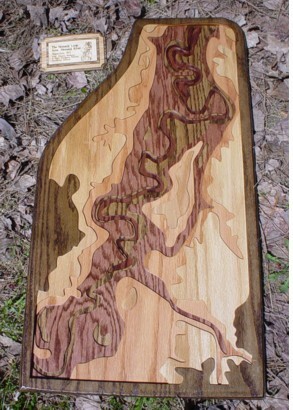 We now make three different versions of wooden lake maps. RED OAK - Our original, beautifully grained Red Oak Veneer Version. BIRCH - In 2007, we introduced our new, bright, clear-grained Birch Veneer Version. NATURAL VENEER - Originally only available in the Great Lakes Series, we now make Natural Veneer lakes by alternating layers of walnut, birch, mahogony, ash, cherry, and oak. Each finished wall hanging is made of six or more layers, custom formed to portray your lake's shoreline and bottom features, as well as highlight all the islands, rockbars, sandbars, and drop-offs! A rich MinWax™ finish brings out the subtle glow of this beautiful wood. The patterns revealed by this topographical technique uncover the unique beauty of each individual lake. 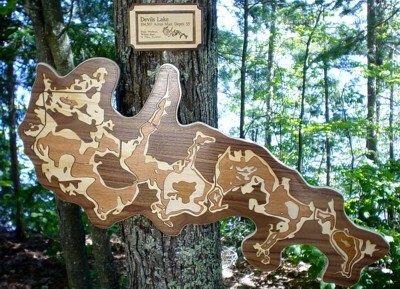 Included with each wooden lake map or each wooden state map is a custom-labeled plaque for your piece with the name and other pertinent information about your lake, including the lake's native fish species, acreage, and maximum depth. 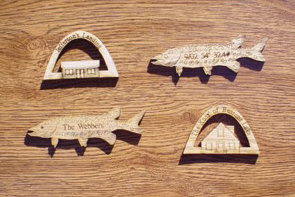 We also provide a small cabin or home icon with each Lake of Wood purchased, complete with custom-etched information such as your family name or the name of your lake home or cottage! 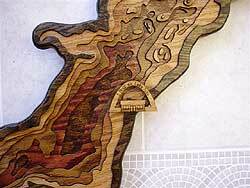 Place it on the shore of YOUR wooden lake wall hanging, and everyone will know just where your home is located by glancing at the piece of art hanging on your wall, which is your own lake, complete with depth contours, islands, sandbars, rock piles, and every curve of the varied shoreline. 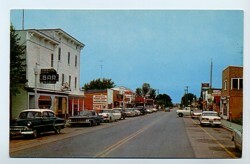 Shipping is available via UPS Ground Insured. Two "wooden lakes" ordered at the same time can be shipped together for one shipping fee. Capture the beauty of nature's handiwork with one-of-a-kind artwork from Lakes of Wood. Contact us today and ask about our specials! thoughtful and unique gift for any lake lover!